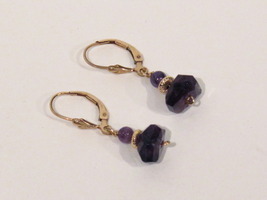 Faceted off-cut Amethyst stones, round Amethyst stones and 14k gold fill bead are all hand wrapped in 14K gold fill wire. 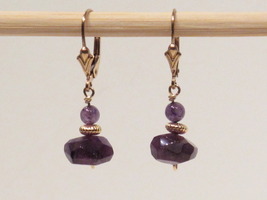 Earrings hang on a secure leverback hook. 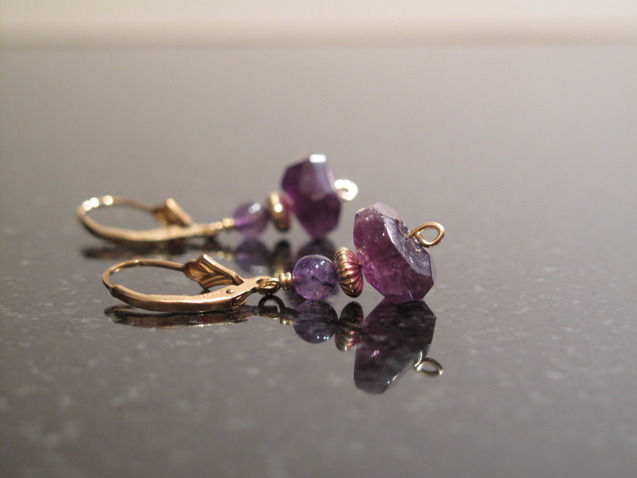 Earrings measure 1" L A variety of crystalline quartz occurring in colors that range from a pale violet to a deep, intense purple. It can be found in many places, specifically Siberia, Brazil Uruguay. The Russian monarch Catherine the Great was passionate about amethysts, and there are also many examples found in the British Crown Jewels. Bishops traditionally wear amethyst rings. It can be used to shield negativity. Each item is hand-made and may differ slightly from the photograph. Contact me for custom order info - this item can be made in a number of different stones or in silver instead of gold. Feel free to contact me with requests.